Located in the small historic Old town of Hastings, after the Blue Reef Aquarium at the end of the promenade that runs along each side of the Rock-a-Nore road along the east coast of Sussex, the town’s shipwreck museum contains historical treasures. 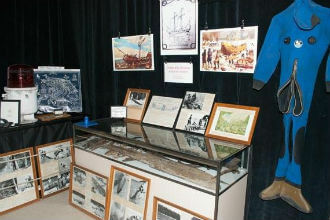 Here, a multitude of objects and artifacts that once belonged to the crews of many ships wrecked in the English Channels are displayed. The museum masterpieces are the objects and parts of the ships of the Amsterdam, a Dutch East Indiaman of 1749, of the Anne of 1690 and from the Charles II warship. The museum tells the international story of navigation in this stretch of sea between France and England implicating, in particular, the French, English, Dutch, Danish and German history. Access to the museum is free, but you can leave a donation if you wish. The museum is part of a maritime park along the coastline where there is plenty of activities and attraction such as a minigolf course, a great aquarium with “sea monsters,” a fun fair and arcade, several museums and lots of spots to eat and drink. Hastings’ shipwreck museum is part of a whole entertainment complex that is not to be missed if you have the chance to visit the area for a great day in East Sussex. The staff of the museum is very welcoming and know fascinating details about the items and artifacts exposed. They are great with kids as well, and they know how to stir up their curiosity. The gift shop is full of great souvenirs and gadgets that kids are raving about. Although a little pricey, given that the museum is totally free, it is definitely a museum that I would recommend to all sea lovers who happen to spend some time in this side of the beautiful region of Sussex.